Once your decking work has been completed, or if you already have a deck, we will be happy to quote for a decking maintenance package. This service covers cleaning your deck to remove lichen and most stains. We can also carry out any repairs that may be necessary and add treatments to protect your timber in the future. We’ll be happy to quote for your property – please ask. 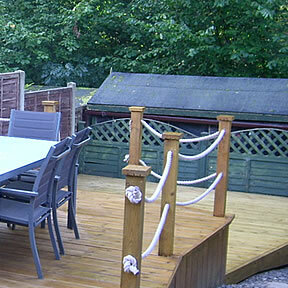 This example is from a decking project in Chandlers Ford. The upper deck has been restored using prep-deck, a quality deck stain stripper. 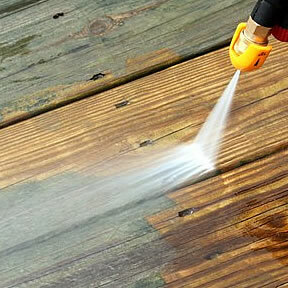 When used with the jet washer, it brought the wood back to a suitable condition for the application of a new stain protection. For the lower deck, a new structure was fitted and new smooth decking boards were used to match the existing deck areas.Then all boards were finished with deck stain, as chosen by the customer. This project was undertaken as part of a maintenance contract. We offer this for all garden decking whether we fit it or it is existing. We work alongside our customers to ensure a well maintained deck throughout the year.